The official date Sheet of Andhra Pradesh Board Exams for Class 10th has been released on the official website of Board of Secondary Education, Andhra Pradesh (BSEAP). Directorate of Government Examinations Andhra Pradesh, also known as AP SSC Board conducts Andhra Pradesh Board Class 10th exam annually. 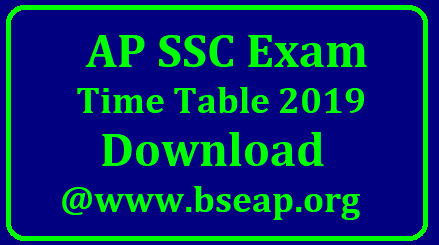 This year, The SSC exam date has been released on the official website http://www.bseap.org/. The exams will be conducted from March 18, 2019, to April 02, 2019. This article will consist detailed information released by Official Andhra Pradesh Board. The same AP SSC time table is applicable for the private students as well. The exam date sheet is designed for Academic Students, OSSC and Vocational Candidates. Date sheet for Class 10th is released on the official website. If students want, they can also go on the official website and download it. Here, we are including the steps of downloading the AP SSC Time table for the comfort of the students. Go on the official website of Directorate of Government Examinations, Andhra Pradesh http://www.bseap.org/. There will be a link under Quick Links named as SSC March 2019 Time Table. The official PDF with AP SSC time table details will be accessed. Click on the arrow on the top right corner to download it. Students are advised to save it for the later references. It is clear that students still got enough time to prepare for the examination. It is advised for the students that before the exam, they must finish the revision of each and every chapter included in their regular syllabus. Apart from that, any other information related to the AP SSC Board Exam will be published here.